One topic to come out of the discussion surrounding the cost to attend LoopConf is the idea that WordCamps can’t be developer focused. One of the most exciting aspects of LoopConf is the chance to dive deep into technical discussions. WordCamps generally cater to a wide range of skill levels, which some feel prevent these types of discussions from occurring. There’s nothing in the WordCamp guidelines that state WordCamps have to cater to all experience levels, it’s just what most organizers do based on the needs of their local community. In 2011, Morten Rand-Hendriksen organized an event called WordCamp Developers held in Vancouver, BC. WordPress developers and designers interested in learning about practical, applied WordPress development by industry leaders and local WordPress practitioners attended the event. Earlier this year, Flynn O’Connor co-organized WordCamp Vancouver, BC Developer Edition. It was a one day event filled with WordPress developer topics including, an introduction to the command line, advanced custom fields, and getting started with unit tests. I interviewed O’Connor to find out how he marketed the event and what he did to achieve a relevant audience. At what point did you realize you needed to have a Developer Edition of WordCamp Vancouver? This is something that our team discussed after the previous year’s WordCamp completed. There was a desire to not only create a camp for WordPress developers but also a WordPress focused event that would be of interest to the larger tech community within Vancouver to see what WordPress could do. While attending other events like CascadiaJS conference, I found myself correcting a lot of people’s old pre-conceived notions of what WordPress is and can do now. How did you market WordCamp Vancouver Developer Edition so that a majority of the attendees are developer or designer oriented? We tried to be clear with our content that this event was going to focus on building with WordPress and not necessarily about end user topics. In emails, on the website, social media and in community posts like the one WPTavern published about our event we tried to get the message out that if you can or wanted to know how to build on WordPress, this would be an event for you. We also connected with other tech related meet up groups and asked for the assistance in getting the word out about our event and reached out to several schools that offered web development programs and offered their students discount tickets. Even so, there are some people who are going to attend because they’re aware of WordPress and want to see what it’s all about but don’t know how to design or develop for it. From our experience, we’ve found you can’t really stop that. What type of feedback did you get after the event? Did some attendees complain that the content was over their head? Yes, we did get some people who said some of the talks were advanced for them. But from the ones I talked to that brought this up, quite of a few of them were not discouraged by this. We can’t cater to everyone and make everyone happy but if we provide our attendees content that will challenge them, then hopefully, we are encouraging them to learn more and helping them to become better developers. What advice can you give to organizers who want to put on a developer focused WordCamp? Reach out to the tech community beyond WordPress, not only for attendees but also speakers. Many of them will be happy to help. Don’t be afraid of the content being too advanced for some attendees but try to balance out the talks so that less experienced developers don’t feel overwhelmed the entire time. Talk to meet up and smaller local event planners to get a sense for your community’s general skill level so you can better anticipate likely attendance levels for the more advanced talks. I am one of the co-organizers for the Vancouver meet up and I focus on the dev branch, so I had a decent idea of how many high level developers in our community would actually attend these events. Organizers are encouraged to experiment and break from the mold while still following the guidelines. 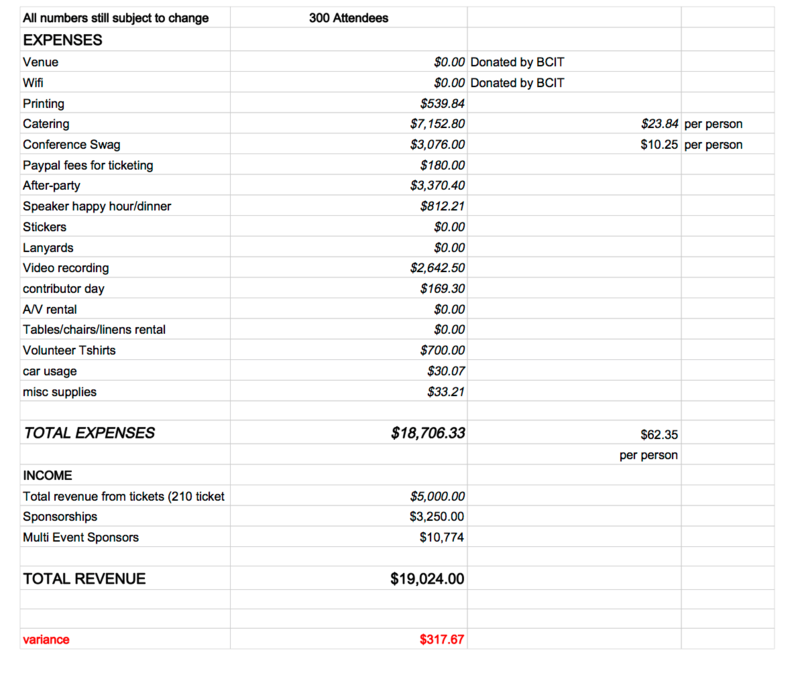 WordCamp Vancouver Developer Edition proves it’s possible and if you look at their budget sheet, it cost just over $18,000. So not only can organizers create a WordPress developer centric event using the WordCamp branding, the financial support of doing so makes it much more affordable. One of the keys to the success of WordCamp Vancouver for developers and designers is understanding the needs of the local WordPress community. If there is sufficient demand and the community is large enough, consider organizing an event in your area. There’s also no rules in the guidelines that limit the amount of WordCamps per year in a given city. This means organizers can continue to have traditional WordCamps while organizing a separate event catered to developers. I want to know from those who have organized 500-1,000 person WordCamps if you plan to branch out and create smaller, niche events while using the WordCamp branding? If so, please let us know in the comments. Also feel free to share concerns, ideas, or ask questions related to organizing a niche event. WordCamp Seattle is doing something similar for 2015. The past few years, WordCamp Seattle has been a big event – nearly 700 people last year. But we have found that even when you have a big event, making it work for a wide range of experience levels is really hard. So in 2015, we’re going to do two smaller events for around 350 people: the first one (March 28) is going to be for experienced users, designers, and developers, and the second one (October) is going to be for beginners. This is a great idea. I’d love to see more big city WordCamps do this sort of bi-annual event with one more niche. I love the idea of more niche WordCamps, but we can’t loose the “all in” WordCamp as a community event type thing. That’s a great point Josh. I’m curious as to how the naming situation is going to work out for all these different WordCamps if indeed larger cities have more than one per year. The marketing has to be dead on so as to not confuse people who may end up needing to figure out which WordCamp is for them. Yes, we are concerned about making sure people end up at the right WordCamp, and this is probably the biggest challenge we face in creating two WordCamps. We will make sure that the WordCamp names are clearly advertised. We also plan to have some quizzes and other fun things like that to help people figure out which camp they belong in. One thing I would also like to commend Seattle for in their 2014 WordCamp was starting the day with intros to WordPress for beginners and more networking time for the experienced attendees. I think that was an excellent way to start the day. I’m looking forward to their March 28th event. Thanks, Flynn! The popularity of that beginner hour is part of the reason we are doing a whole camp just for beginners.